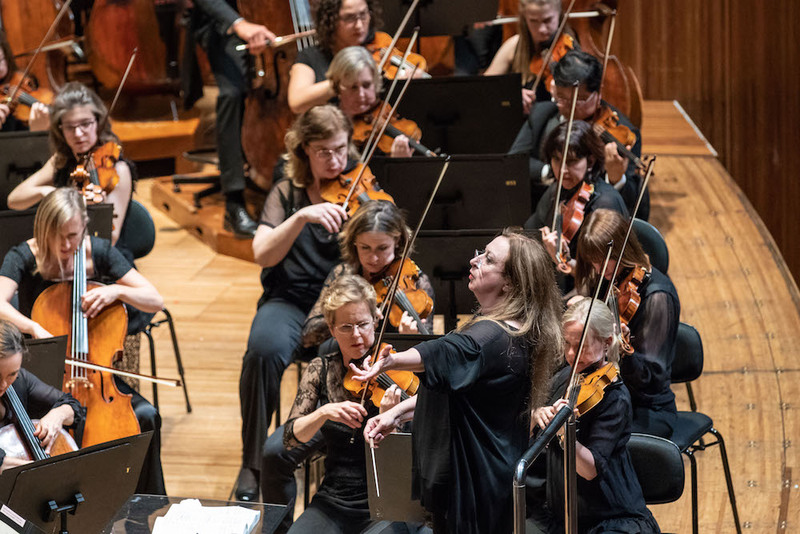 First, to put obsessive Mahlerians out of their misery as soon as possible over one of the great dichotomies of our time, Simone Young put the Andante of Mahler’s Sixth Symphony second, in contrast to her 2014 Queensland performance where it was the third movement. (Asher Fisch, in his recent WASO performances, used each placement on consecutive nights!) Is the increasing tendency to place the “slow” movement second intended to reinforce the notion that this is Mahler’s most “Classical” Symphony, I wonder? In the opening movement Young found the ideal pulse for the “goose step” march, neither baleful and doom laden nor an hysterical scuttle, and she handled the tempo transitions to the “Alma” theme and the “starry sky” episode particularly effectively. She also observed the exposition repeat, which few conductors do. Controlling the climaxes is more important in this Symphony than in all the others and Young kept her powder dry for the euphoric coda which has all the intense confected “joy” of the last movement of Shostakovich’s Fifth. The brass playing, of a high order throughout what must be one of the most taxing works in the repertoire, reminded me of Keats’ “silver snarling trumpets”. There is no hint of impending tragedy in the Andante, but rather a bucolic or alpine charm and an emotional climate rather like that of the slow movement of Rachmaninov’s Second Symphony, except with cowbells the only reminder of more terrestrial existence. Again, Young handled the gentle accumulation of climactic tension perfectly, unlike Karajan, who made a meal of it by treating it as a fully-fledged Adagio. Young brought out the eeriness and bizarrerie of the Scherzo with its stuttering rhythms and perky woodwind (well captured) which hark back in a quaint parody of the march of the first movement. Alma Mahler contended that this movement depicted their children at play but it always reminds me more of a sinister troupe of marionettes. I still think the Scherzo should be placed second (no correspondence will be entered into) as it maintains virtually the same tempo as the previous movement, and intensifies the ambiguity between the image of children playing and the underlying doom. The finale is probably Mahler’s most problematic movement, as long as the first movement of the Third Symphony and a universe in itself. Again, pacing was excellent and right from the first chord, the sense of tragedy was stark. The opening always reminds me of the “tentative” beginning of the last movement of Beethoven’s Ninth, where the composer revisits earlier themes. This makes the effect even more ominous when the new thematic material is added and the music finally lumbers into motion. It depicts a nightmare world full of sudden horrors which rear up to interrupt the Allegro energico. Heroic themes try to assert themselves but are continually thwarted by the sickening hammer blows of fate. Here, I felt the blows simply weren’t sickeningly dull enough but I was convinced by Young’s decision to ignore Mahler’s instruction and restore the third blow which makes the final climax more terminally emphatic. It sounds curiously limp without it. By the end, it’s always hard to determine whether we’ve reach the abyss or have arrived in a sort of moonscape where the temperature has reached absolute zero. Whatever! The Sydney Symphony reached white heat in this movement and I don’t think I’ve ever heard an orchestra play with such manic abandon. Before the interval of what turned out to be an absolutely epic evening, tenor Steve Davislim sang Britten’s Les Illuminations. The last (and only) time I’ve heard this was in 1982 with the soprano Heather Harper and the visiting BBC Symphony Orchestra under Sir John Pritchard. I can then put down my complete incomprehension of this, admittedly rarefied, work to my youth. Davislim’s singing was as characteristically vivid in response to the texts as was Britten’s to these strange worlds of the French symbolist poet Rimbaud’s imagination, surreal juxtapositions and fevered sexuality. The string writing is quite assertive and the SSO’s strings sounded pellucid. What a concert!